A month into my Year Of Nothing New and so far, so good. What do you mean it’s only been four weeks? 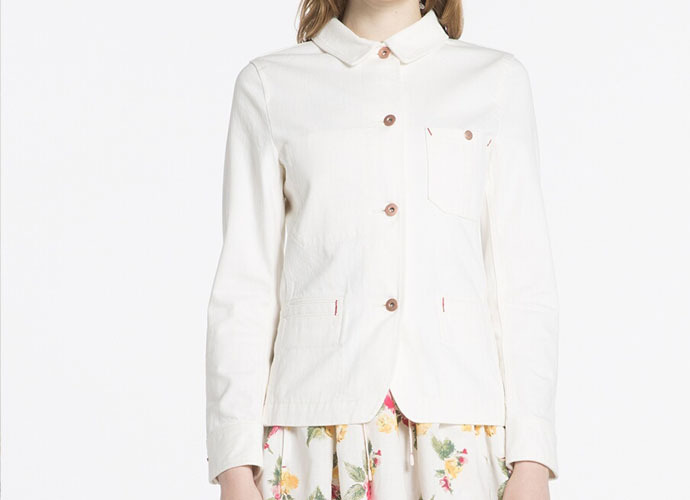 I’ve successful navigated those tempting sales racks and ubiquitous ‘extra 20% off sale price!’ emails that pop temptingly into my inbox and have kept well away from shops so as not to be lured into browsing new season clothes. Instead I have found myself looking harder at what I’ve got, mending broken seams, darning holes in jackets -who would have thought this could be so satisfying? – and making things fit better. I have quite a few bought-in-a-moment-of-sale-madness clothes that don’t quite fit as well as they should, so I’ve been tweaking trousers seams for a straighter leg, removing hippy-overload fringing (vintage scarf, found during a Stevie Nicks ‘moment’ in Lewes) and moving buttons on cuffs to make shirt sleeves look better fitted on my wrists. With my podcasts on ‘queue’ and sewing basket at the ready I’ve been happily hibernating for most of January. I confess I have needed a fashion fix, and have been browsing sites for a hit of sartorial inspiration. It seems the coolest women are wearing winter white. 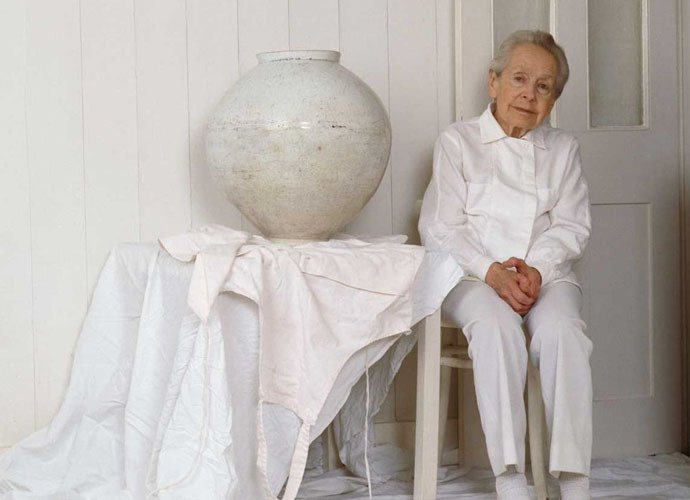 I loved this image from Vogue (above) of the ceramicist Dame Lucie Rie, from a fascinating article by Suzy Menkes, Ms Rie frequently wore all white, and made beautiful buttons for fashion designers when she first came to London, Issey Miyake was a big fan, she left all her button moulds to him when she died. Dame Lucie fled to London as a refuge during the war, where she set up her studio and became one of the greatest potters ever, weren’t we lucky to get her? The simplicity of all white, particularly when worn in winter rather than summer, where it is more expected, carries a strong visual impact, it’s one I love. On one of my only forays outside (to Portobello to buy cake) and while thinking about how interesting white is to wear during the grim grey-ness of January, I spotted Rosa, a visitor from Barcelona. She spoke no English but her daughter, who lives here, kindly translated and I persuaded her to pose in her all-white ensemble. Rosa only ever wears white, it suits her skin-colour and she loves that it makes her feel fresh and clean. I thought she looked fabulous. 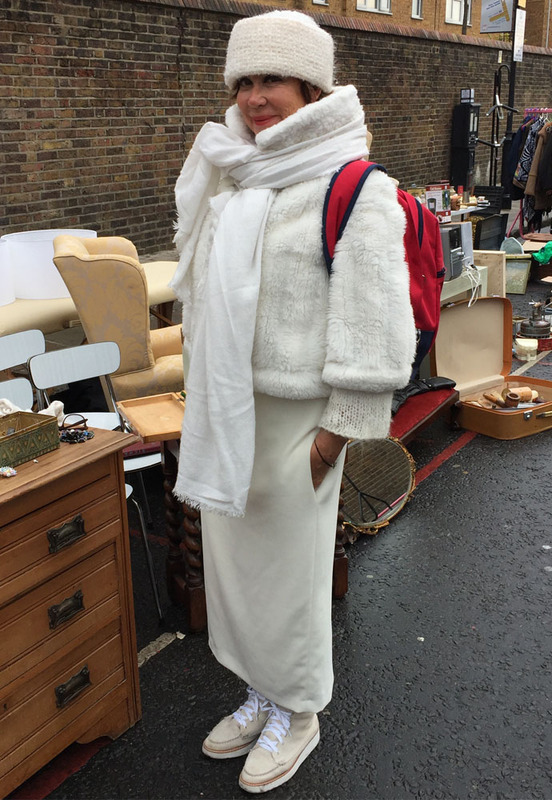 The textural layering of her faux-fur jacket over open-knit jumper and wool skirt really stood out in white, and that two-tone white going on with her (gorgeous) leather shoes and laces just kept up the interest. And I’d be lying if I said I hadn’t been tempted by ANYTHING in January. 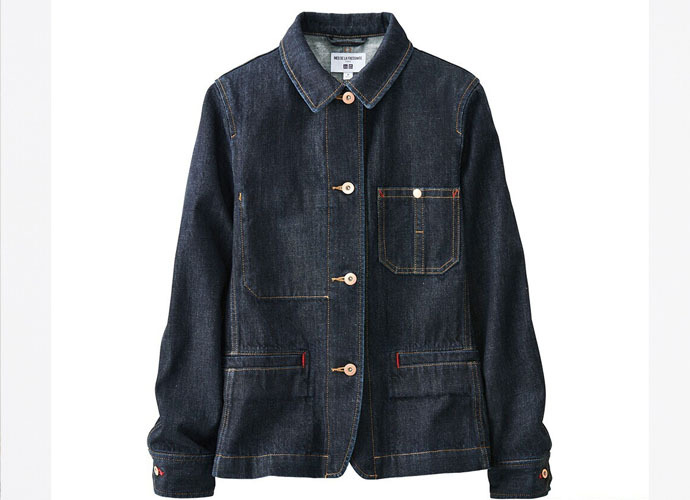 Actually I was really tempted by it in denim, but keeping with the white theme, I reckon this in either colourway is worth a look. 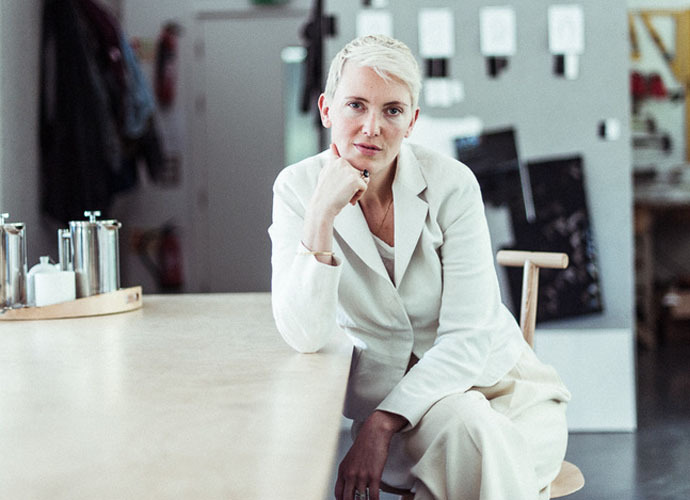 And I’ve worn my Palmer Harding/ Modern Rarity white shirt so much I’d probably be looking to add another to my collection if I was buying…I’ve loved the quality and the interesting design on mine, I’m kinda sad I can’t buy this one in the new range. 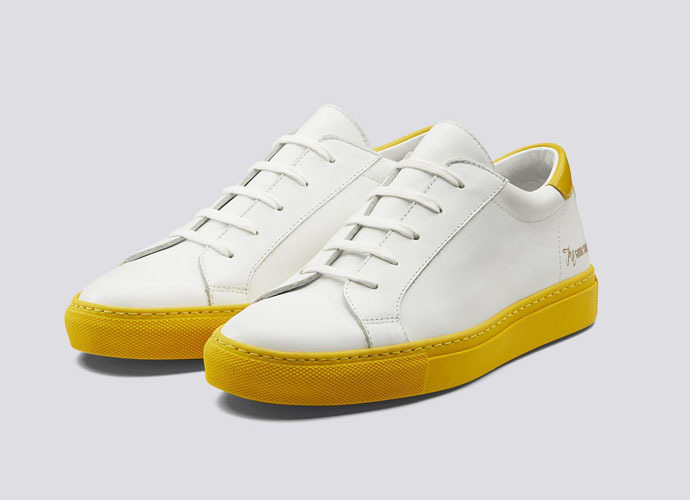 And then, darn it, the best shoe company (Grenson, obvs) in the world went and made a pair of lux white sneakers, trimmed in assorted colours, that I’d have snapped up under normal circumstances. Of course, as you know, I have plenty of other Grensons to wear out first, and I’m sure these ones will still be available next year too. So I’m off to practice winter white combinations with my existing wardrobe, but I’ll leave you with a few other ideas below. How is everyone else on the no-buy year doing? Next articleTrend Alert: Sweatshirts are back! Well worth a visit to see all the beautiful work. Just when I’d decided to clear everything white from my wardrobe as it finally dawned on me that however much I want it to, it just doesn’t suit my ageing redhead colouring! 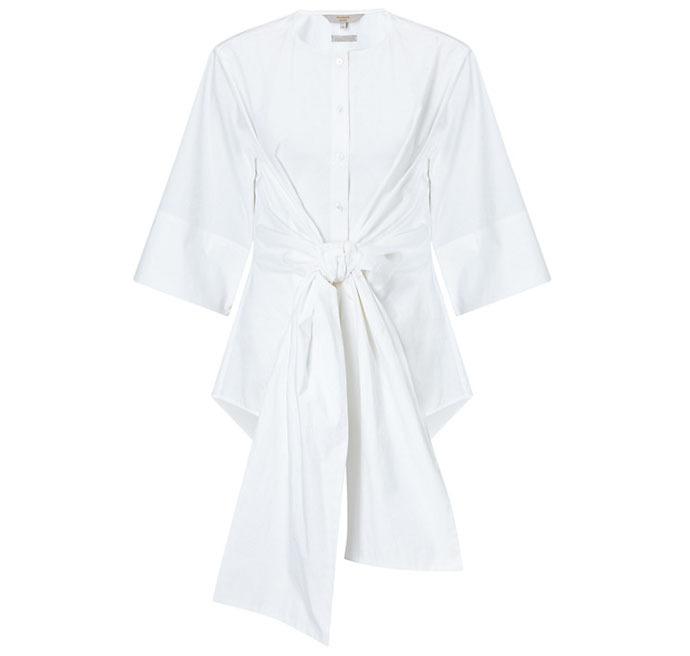 Quite like all white in winter – whilst my Stutterheim white stripey raincoat is great, I’m not sure I could cope with maintaining proper clothing, though. I did just buy some white Maryam Nassir Zadeh pumps, super discounted in the Matches sale (have also sold a stack of stuff on eBay this January, too. So it’s allowed. Possibly).